Your job as an educator is more than a title. And your teacher resume is more than a piece of paper. Education degrees are one of the most common graduate degrees out there. Thousands of prospective job seekers join the mix every year. So, you have some internship and classroom management experience. Great. So does everyone else in your situation. That’s why you need to know how to make a teacher resume that goes beyond your degree and experience. You’ve got to put your unique approach to teaching and your qualifications front and center. You’ve got to make sure you stand out in EVERY way. A teacher resume example better than 9 out of 10 other resumes. How to write a teaching resume that will land you more interviews. Tips and examples of how to put skills and achievements on a teacher resume. How to describe your experience on a resume for a teacher to get any job you want. Here's a sample resume for a teacher made using our resume builder. What’s the Best Format for a Teacher Resume? There are many different kinds of teachers. You could be a high-school teacher or a substitute teacher. You could teach a particular subject such as music. That’s why each teacher resume is different. At the same time, most of you will want to use the same format for a teaching resume. The reverse-chronological resume format is a good choice in almost any situation. As the most traditional format, it will keep your teacher resume clean and organized. More experienced candidates may want to consider a combination format. The format allows you to use your skills as subheadings in your experience section. Substitute teachers may want to focus less on the many gigs they’ve had over the years and more on their skills. That’s why they may opt for a functional resume format. The format allows you to push your experience to the bottom of your teaching resume. It's the one situation where it doesn't look sneaky to include your job history as an afterthought. Some of you may wish to show you’re in touch with recent trends. So, you can get a little creative with the more traditional formats by adding extra sections. 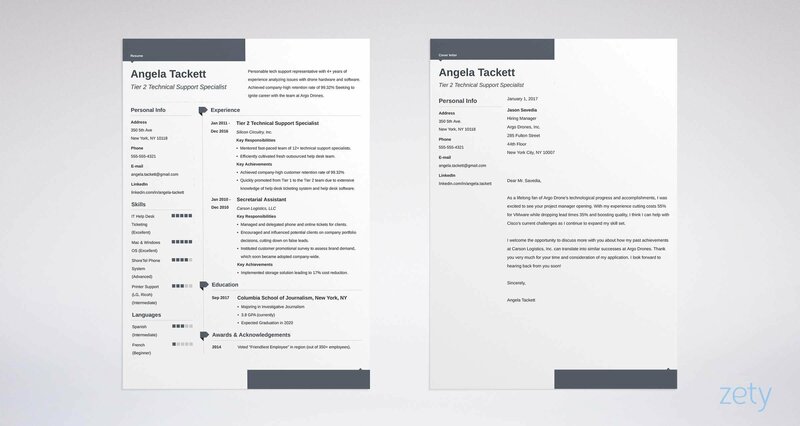 You can use templates that give your teaching resume a different look. Don’t be afraid to make adjustments to suit your needs. That said, you’ll want to use traditional fonts and sizing. Readability is key. So, no Comic Sans or other elaborate and fancy fonts that look unprofessional and messy. Remember, the average recruiter spends six seconds scanning your teacher resume. So, make it easy for them to find what they need! 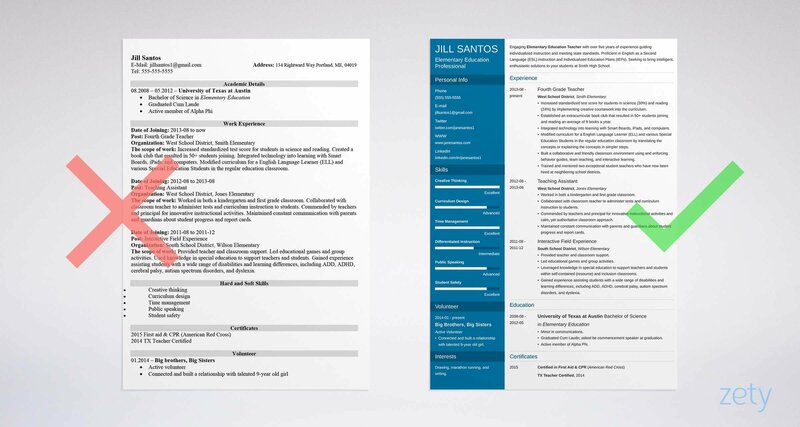 Pro Tip: Consider using a resume template. As a teacher, you’re already innovative and creative in the management of your classroom. Don’t be afraid to be creative with your teaching resume. Let’s start with the basics, the most critical part of your teacher resume. Telling you to include contact information may seem like an obvious "smack-you-on-the-forehead-duh" statement. But it’s so obvious that sometimes you can forget to update or add information. First, check for typos or misspellings that would hinder a recruiter’s ability to contact you. Second, make your name prominent. Students know you by your surname, right? So, make yours stand out! Finally, lose that unprofessional, silly email addresses you created in 2000. District staff members frown upon email addresses that suggest immaturity. They’d prefer a professional email that highlights your professional aspirations. Another way to improve your contact information is to include your LinkedIn handle. Adding social media handles to your teacher resume shows you can keep up with trends. Plus, more than half (53%) of employers feel they need more than a resume to assess if someone is a fit for the job. So, they go online to find out more about promising candidates. That’s why it’s best to include links to personal websites and relevant social handles. They give recruiters more insight into you as a potential employee. Online presence matters in the hiring process - and that’s especially true for teachers! The rise of social media means hiring managers want candidates with clean profiles. Pro Tip: Be sure to clean up your social media profiles before applying to have the best teacher resume. If you're looking for teaching jobs, check out this list of education job boards. Remove any pictures or posts that will cast a negative light on you. Those concert photos from last summer at Coachella—remove them! Those controversial retweets about the presidential election—erase them. Let your personality and background be what influences their decision. The best way to start a resume for a teacher is with an opening statement. A few lines that tell a hiring manager what value you’d bring to the job. And whether you use a resume objective or resume summary, you want the hiring manager to read past line one. You’re writing an entry-level resume for teachers. You’re making a career change resume. You’re targeting a particular position. But wait. I thought resume objectives were dead? In some ways, you are right. But resume objectives can be effective and purposeful. Recruiters want to know what’s in it for them if they hire you. So, give them what they want - VALUE! With a resume objective, you want to state why you’re a good fit for the position and what you offer that few others will. Highly-motivated Elementary Education graduate looking to fill a position as a Music Teacher. Organized, hardworking, and energetic. Wishing to leverage my passion for technology and instruction to influence students. I am a teaching graduate looking to fill the open music position at Smith Elementary. 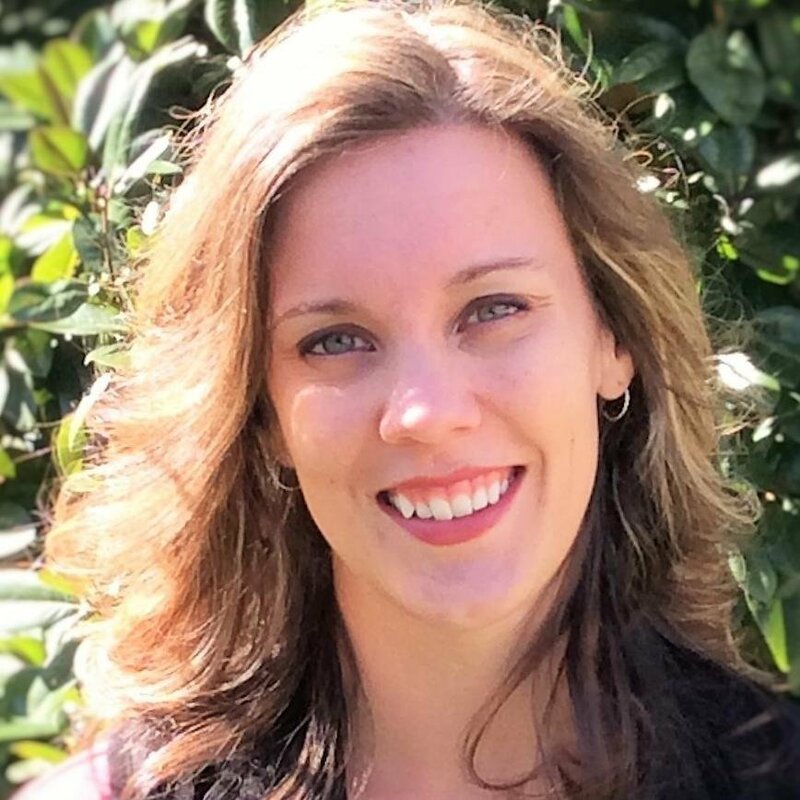 Energetic Educator able to apply classroom management and problem-solving skills as a Substitute Teacher at Bess School District. Patient yet authoritative instructor wishing to become an asset to the district. To interview at Bess High School for the open substitute teaching position. Looking to utilize my knowledge as an elementary education graduate. If you have a broad range of classroom experience, a resume summary will better serve your purposes. You have multiple years of professional experience. You are not making a career change. Engaging Secondary Education Teacher with 5+ years of experience guiding individualized instruction and meeting state standards. Proficient in English as a Second Language (ESL) instruction and Individualized Education Plans (IEPs). Seeking to bring intelligent, enthusiastic solutions to your Science department at Smith High School. I am an engaging Assistant High School Teacher with extensive teaching experience and a record of meeting standards. Knowledgeable in ESL and IEPs. I’d love to support your science department at Smith High School. Proactive Assistant Teacher with 3+ years collaborating with and supporting teachers in the classroom. Can provide bilingual instruction and education assessments. Seeking to provide an intelligent and engaging environment for learning at Carol Academy. Have an Associates Degree in Early Childhood Education. I am an engaging First Year Teaching Assistant with extensive experience helping teachers administer testing materials to students and work with families. I wish to bring my 3+ years of knowledge to your learning center. Keep sentences short, sweet, and specific. Quantify skills and achievements with numbers and figures where possible. Focus on two to three critical skills that the job description emphasizes. Pro Tip: Consider writing this section last. Think about your accomplishments. Where do you excel? Before writing your statement, have an honest conversation with yourself about your unique values. Your work experience is not just a list of duties and responsibilities. You shape students’ lives in a positive way. Make sure you say so! Start with your most recent job first. Include your title, the dates you held the position, the name of your school, and the location. Then list up to six past responsibilities and achievements under each position. Be sure to tailor your teacher resume information to the job offer. Increased standardized test scores in Math (30%) and Science (24%) by implementing creative coursework into the curriculum as an Elementary School Teacher. Provided standardized testing support to students using curriculum-based instruction. Notice that there’s a difference between achievements and responsibilities. Responsibilities are the day to day facts of your job—and they are true for every teacher. Results set you apart from your competition. Increased standardized test scores for students in Writing (30%) and English (24%) by implementing creative coursework into the curriculum. Established an extracurricular book club that resulted in 50+ students joining and reading an average of 15 books a year. Integrated technology into learning with Smart Boards, iPads, and computers. Modified curriculum for an English Language Learners (ELL) and several Special Education Students in the regular education classroom by translating the concepts or explaining the concepts in simpler steps. Built a collaborative and friendly classroom environment using and enforcing behavior guides, team teaching, and interactive learning. Trained and mentored two exceptional student teachers who have now been hired by neighboring school districts. Increased standardized test scores for students in Math (29%) and Geometry (36%) by implementing customized and interactive coursework into the curriculum. Introduced a system for simplifying more complex math concepts for comprehensive understanding. Supported a diverse classroom of learners with a combination of both at-risk and exceptional students. Determined areas of strengths and weaknesses, then modified the curriculum to support each student’s learning styles. Received Teacher of the Year Award in 2010 after demonstrating strong skills in teacher/parent communication. 1. Teacher Specifics: curriculum-based knowledge and varied methods of teaching. For example, a Physical Education teacher resume might include SPARK! curriculum. 2. Numbers and Figures: anything you can quantify. 3. Outside Involvement: contributing to other areas of school activities. Remember, personalized teaching resumes out-perform the best generic resume examples for a teacher. In fact, 63% of recruiters want resumes tailored to the open position. Try searching for job offers to see what responsibilities they advertise. Then make an entry based on that information. You can go ahead and drop routine tasks all teachers handle. That just wastes valuable space for your real qualifiers. Pro Tip: Add that extra zing to each bullet point by using power words. For example, leadership is a necessary teaching skill, but everyone uses the word “led.” Doesn’t spearheaded or delegated sound so much stronger? You can’t be a teacher if you’re not certified. And that’s why it’s important to make sure a recruiter can see right away that you’re qualified. Consider creating a separate section for your certificates. You can add it to your teacher resume before your experience or education sections. Teachers also complete a lot of training to get their degrees. Everything from interactive field experience and internships, to classroom training. This extra training can also get its own section. For an entry level teacher resume or a first-time teacher resume, additional training can go directly in your experience section. Pro Tip: Let’s say you’re creating your teaching resume in anticipation of finishing a certification. Add the certificate along with the expected completion date. Are you writing an entry-level teaching resume? If so, you should list your education towards the top of your new resume for a teacher right under your resume objective. If you have a few years of experience, let your professional background do the talking. Put your education after your experience section. You should always list your highest degree first. Include the type of degree earned, your major, the accredited university, and it’s location. The order does not matter. Are your a writing a graduate teacher resume? Brag about high honors, scholarships, awards, or a GPA greater than a 3.0. That experience studying abroad? Include it! You must complete and meet all lateral entry requirements. List them here, too! Pro Tip: Never generalize your teaching degree. Take the opportunity to include industry-related keywords for your teacher resume. Job offers are the best place to find skills for a resume for a teacher. As a teacher, you may find that most schools advertise open positions on a district website. Browse the district’s “About” and “Career” pages to see what skills or areas of instruction are in highest demand. District websites tell you the licensure or certifications required at minimum. Be sure to include these—if you have them—to help your teacher resume pass screening. Teaching buzzwords like “common core,” “North Carolina standards of study,” “IEP,” and “Peer Teaching” are all words that commonly appear on job sites. Include them on your teaching resume. You can also head to LinkedIn for some additional research. Look at other teaching profiles to find out which skill endorsements are most common. You’ll want to list the skills most applicable to the type of teaching position you’re targeting. The teaching profession requires many broad areas of expertise along with specialized skills sets. For example, an Art Teacher resume needs a different skill set from a Preschool Teacher resume. A combo of hard skills (Microsoft Excel) and soft skills (professional demeanor) are necessary here. Use the following list for reference. Unsure of what to list as hard skills? Start with technology. One way modern teachers can differentiate themselves from others is with tech skills. Do you incorporate technology into your classroom instruction? Add it to your teacher resume. It’s desirable for teachers to use iPads, computers, or smart boards in the classroom. So, be specific about the devices and programmes that are familiar to you. Pro Tip: Get detailed. Use both abbreviations and full wording. Make sure to include both “Individual Education Plans” and “IEP” on your teacher resume. You’re more than just classrooms and testing. Adding other activities and experience will speak for you as a candidate. Plus, it helps the recruiter relate to you! "All things being equal, wouldn't you want to hang out with the person that also loves to cook, can talk about sports at lunch, or volunteers in the community?" Are you a member of the National Education Association (NEA)? Did you attend any big conferences about "inclusive learning" or how to teach in the digital age? Pro Tip: Community involvement, personality, and commitment are essential qualities for teachers. Consider including these entries in an “Extracurricular” section. Applying for a job without attaching a cover letter is like eating a cake without icing. Let’s debunk a common career myth right now - cover letters are still required! In fact, 45% of recruiters will toss your resume if there is no cover letter. But to make your letter great, you must tailor your cover letter to each job description. A little bit of simple research is all you need to do. Take 10 minutes to pinpoint the name of the principal at the school. Then, address your cover letter directly to that person. Even better, introduce yourself to the principal or assistant principal. That way, they already know who you are when they receive your teacher resume and cover letter. Write an engaging first sentence and use a bit of humor. Next, tell a story to support your successful classroom management and organizational skills. Remember that room full of hyped-up students before Christmas vacation last year? Tell the story about how you used an interactive game to keep them engaged. No matter how you say it, make an impact. Writing a teacher resume can seem overwhelming. There aren’t too many ways to differentiate yourself from the competition. Highlight your education in a separate section. Move it to the top of your teaching resumes if you don't have experience. Remember to include all relevant degrees, courses and certifications. Add your duties in form of achievements. Include values, numbers and percentages to underline your success. List all relevant teaching experience. Include any volunteer and childminding positions, and other teacher-related activities and gigs. Tailor your teaching resume to the job ad. A targeted resume is one that is customized to this particular job opening. Add keywords from the job posting to pass the ATS test. Choose the right resume format. Make good use of white space and go for legible fonts. Use 11 to 12 pt size for all contents. Divide sections by a single blank line. Be consistent with your formatting. Edit and proofread your resume. Spelling or grammar error make your teaching resumes look unprofessional. Do you have any questions on how to make a teacher resume? Give us a shout in the comments section! Lauren is a freelance writer and blogger. When she's not writing about resumes, career, and money, she can be found exploring the mountains of North Carolina or cheering on her favorite Philadelphia sports teams. Want to know how to become a teacher? Struggling to understand which teacher certification to obtain and other requirements? Our guide will help *teach* you what to do to become an educator.